How the NYC-based dermatologist eliminated skincare layering by creating a one-and-done cream with all the ingredients you’ll ever need. VIOLET GREY profiles female beauty entrepreneurs who are considered industry game changers because of their individual approach to business. Each one entered the conversation in her own manner and maintained a steady, if not unparalleled, trajectory with her indomitable spirit. 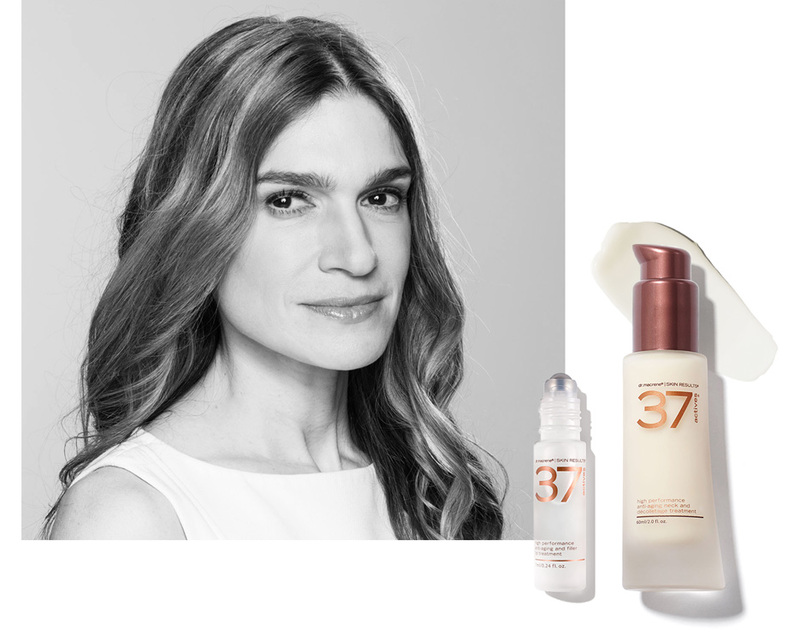 Here, we talk to Dr. Macrene Alexiades, the founder and NYC-based dermatologist behind 37 Actives. My bedroom is light, airy, and clean, and always includes fresh bed linens stocked with way too many pillows. I have tons of closets packed full of my biggest weakness: fashion! I also have a fantastic bright view of the East River, and off my bedroom there is a special terrace with two chaise lounges for my afternoon reading. My bed is a custom four-poster king in antique white. Custom handmade silk drapes hang on each corner post, and I have a matching silk bedskirt. The mattress itself is relatively hard with a cashmere top. My favorite thing about my bed is the height. I have the thickest box spring and mattress, so I have to climb steps to get onto the bed. My bed feels romantic, like it’s from a bygone era, but it’s not outdated—it also has a distinctly modern touch. The height also lets me really enjoy the water views. Unfortunately, because of the nature of my work, I rise extremely early. My white shepherd, Zeus, gets picked up at 5:45 a.m. for his walk and to go to daycare. After that, I have to tend to my white teacup Persian, Cleo; she usually wants some TLC in the morning. Then I turn my attention to preparing my son’s breakfast before hopping in the shower and getting myself ready for work (my daughter is already a freshman at Harvard College, so I am down to one!). Of course, all my shower accoutrements are natural or organic, and I pat dry and apply 37 Actives as soon as I step out. I use the regular cream first, followed by the serum on the face, neck, chest, and tops of hands. Then I apply my lip treatment: a drop on the upper lip and a drop on the lower. Not many. During the workweek, I am known to sleep as little as four to five hours to get all my work done and still see the number of patients that command my attention. However, my natural clock is a delayed circadian rhythm (go to bed late and get up late). I was meant to live on a Greek island! My natural tendency is to stay up until the wee hours at night and to rise relatively later in the morning after a good eight-and-a-half hours of sleep. However, that is possible only one day of the weekend and when I am in Greece in the summer. I always have my incense crystals, my lavender oil, and my silk eye mask in case my son is up late. Sometimes I keep a bouquet of fresh flowers beside me if it’s a scent I desire. I believe in aromatherapy, and you witness beautiful dreams if you smell beautiful essential oils or flowers. Finally, I have an air-filter device by my bedside that I use sporadically; it is essential when you have animals in the home and to keep the air free of any mold spores or particles. I drink French press organic coffee in a glass—no plastic! No, but I walk to work, which is about a mile or so. Usually I walk very briskly. I have a trainer who used to train the Israeli army, and I work out with her once a week. The rest of my exercise I get doing lasers and working on my farm on the weekends. I have it down to a science. I wash with lukewarm water and pat dry, and while still damp, I apply 37 Actives regular cream. Then I use 37 Actives serum on top and follow that with my Neck and Décolletage Cream on the décolletage and tops of my hands. Finally, I use 37 Actives lip treatment—a touch on both lips. I use 37 Actives Treatment Foundation in Light under my eyes and occasionally on the lips or around my nose. I shower every morning; wash, condition, and air-dry only. I am fortunate that I have a natural beauty wave. I rise early and check my messages, my emails, and then the news on my apps. By the time I am at the office seeing patients at 8 a.m., I have already handled the overnight messages and emails. I review all pathology reports that came in overnight as well as labs or other urgent matters. I document decision-making and an action plan for each case, contact the patients as necessary, and move to the patient schedule for the day. I am usually there by 8 a.m.